Ottawa/Macdonald–Cartier International Airport or Macdonald–Cartier International Airport (L'aéroport international Macdonald-Cartier in French), (IATA: YOW, ICAO: CYOW) in Ottawa, Ontario, Canada is an international airport named after the Canadian statesmen and two of the "founding fathers of Canada", Sir John A. Macdonald and Sir George-Étienne Cartier. Located in the south end of the city, 5.5 nautical miles (10.2 km; 6.3 mi) south of downtown Ottawa, it is Canada's sixth-busiest airport, Ontario's second-busiest airport by airline passenger traffic, and Canada's sixth-busiest by aircraft movements, with 4,839,677 passengers and 150,815 aircraft movements in 2017. The airport is the home base for First Air. 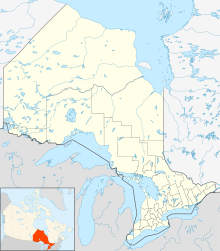 The airport is classified as an airport of entry by Nav Canada, and is staffed by the Canada Border Services Agency. The airport is one of eight Canadian airports that have United States border preclearance facilities. The airport used to be a military base known as CFB Ottawa South/CFB Uplands. Although it is no longer a Canadian Forces Base, it is still home to the Royal Canadian Air Force's 412 Transport Squadron, which provides air transport for Canadian and foreign government officials. The airport was renamed "Ottawa International Airport" in 1964. 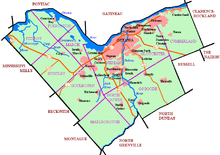 It became "Ottawa Macdonald–Cartier International Airport" in 1993. The old terminal and tower were built in 1960 was a modernist International style designed by architects James Strutt, William Gilleland and Transport Canada. They had been heavily renovated and modernized in 1985–87, which included the removal of a seating area containing personal television screens which would provide 15 minutes of VHF TV channels for 25 cents, as well as an open ceiling design. It was demolished in 2008 to make way for Phase II of the new terminal. Macdonald–Cartier Airport is part of Canada's busiest air corridor between Ottawa, Montreal, and Toronto, which is commonly referred to as the Eastern Triangle. The airport is also a gateway for flights to the eastern Arctic via Iqaluit. While Ottawa's airport serves many major North American airlines and has flights to Europe, and several cities in the United States, Ottawa is only the fifth-largest metropolitan area of Canada and is not a hub for any airline. The 2010 Airport Service Quality (ASQ) Award for Best Airport in the World for the 2–5 million passengers category went to Ottawa Airport. In February 2010, Ottawa Macdonald–Cartier International Airport was recognized by customers for its excellent customer service in the results of Airports Council International's (ACI) Airport Service Quality (ASQ) program. For the fifth consecutive year, Ottawa placed second overall for worldwide airports that serve between 0 and 5 million passengers. In 2008, 118 airports from around the world participated in ASQ. ^ a b "November 2006 – A Page in History Has Been Turned". Ottawa-airport.ca. 1960-06-30. Archived from the original on 2011-05-27. Retrieved 2011-02-23. ^ "Airport, treasure hunting firm take Ottawa Tourism prizes – Tourism – Local – Ottawa Business Journal". Obj.ca. 2010-03-26. Archived from the original on 2011-06-17. Retrieved 2011-02-23. Past three hours METARs, SPECI and current TAFs for Ottawa Macdonald–Cartier International Airport from Nav Canada as available. This page was last edited on 25 March 2019, at 15:25 (UTC).